Enrollment for the Spring 12 Week Session starts Friday, February 1st! Enroll on February 1st.... Get 1 FREE Private Lesson!! Don't miss out, everyone wants a free private lesson and now is your chance! It's so exciting the Spring 12 Week Session is almost here! 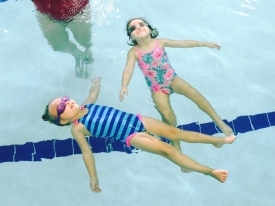 This is a great time to learn essential swimming skills before summer. We want all of our swimmers to enjoy the water safely. Checkout below all the exciting changes for 2019! There are more reasons to swim at AquaKids than ever before! This session fills up quickly so if you see a class that is a good fit, make sure to jump on it. See you at the pool! Please select your location below for pricing and to view schedules.